When I started writing about construction projects, it seemed like they were relatively unreported by different news sources. Now it seems like I can’t avoid seeing an Ithaca Journal or Cornell Sun article detailing some construction project. I dunno if that’s because someone decided that construction is suddenly more noteworthy or if I’m just relatively more observant on these sort of things now that I live outside the area, and information is harder to retrieve. Lately, another reason might be that there’s been a ton of new projects coming down the pipeline. In the latest Ithaca Times, it has been noted that Fairfield Inn project down in big box land, and the Seneca Way project, have both met their final approvals, which means sites can be cleared and construction can start hopefully in the near future. While that should be no problem for the hotel, the funding concerns with Seneca Way may cause some delays with that project, and it will be a waiting game to see when site prep begins and construction starts. Personally, I’m hoping to avoid a repeat of Ithaca Gun. As for new projects, a new sketch plan was proposed, informally referred to as the “Johnson’s Boatyard Housing Project”. The project is sited for Willow Avenue, which lies to the northwest of Fall Creek, on a parcel of land jutting out past Route 13 and across the inlet from Cass Park (so, right next to the city golf course). Apart from the boatyard, there are several light industrial and commercial properties, as well as some undeveloped space. 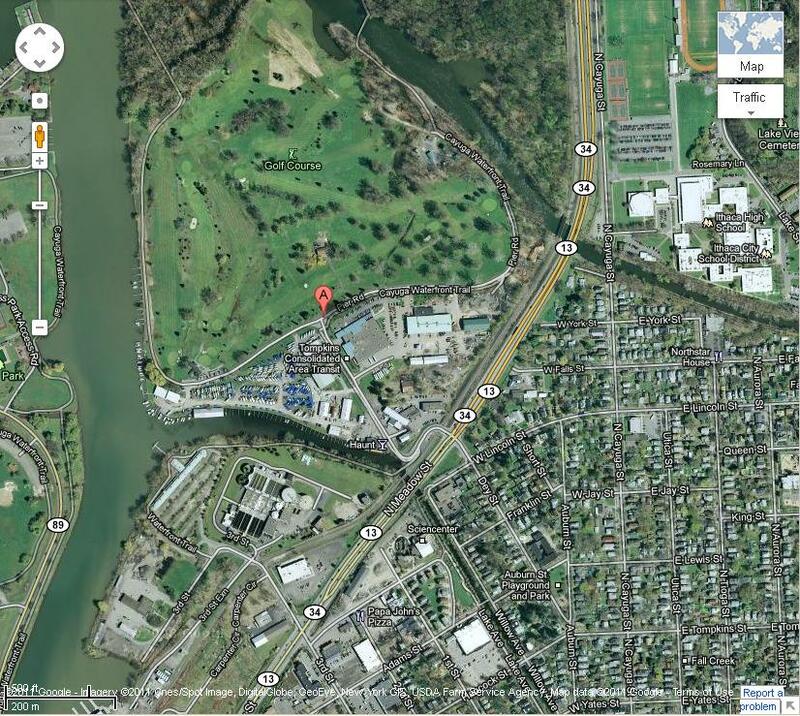 Since the project is planned to be adjacent to Willow Avenue, I suspect it is within the already developed area. The sketch proposal suggests three phases of development. The first phase, to start next year, will build about 20 townhouses. The second and third phases will be multistory (2-4 floor) mixed use buildings (retail on bottom, apartments on top) built near or along Willow Avenue. Market conditions will decide the final scale and timeline for those phases. 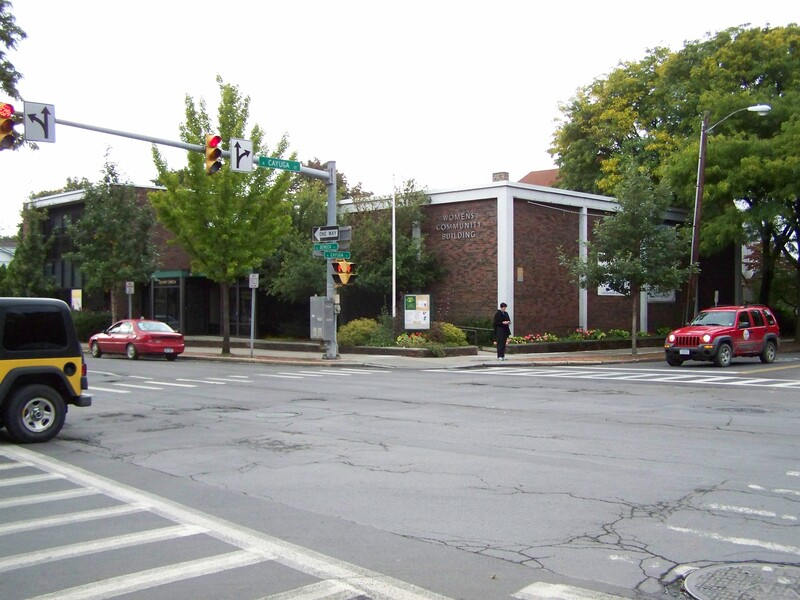 Last but not least, and this falls more into the rumor mill, but Tompkins County is planning a Center of Government building in downtown to place all of its administrative services under one roof. The possibilities range from a new building on the site of the now-vacant old county library, or renovating and adding on more floors to adding 2 or three floors to the Board of Elections Building on Buffalo Street. The final decision will be made within the next several months. So, quite a bit of news in the past month. The approval of the Breckinridge Project (52 apts, 6 floors), the approval of the Seneca Way Project (32 units + retail, 5 floors), the approval of the Vine Street Cottages project (29 units), the Holiday Inn expansion (9 floors), the approval of the Fairfield Inn project (4 floors), the announcement of the new Humanities Building (66,500 sq ft) and new information on Gates Hall (101,000 sq ft), the announcement of the Johnson Boatyard Project (20+ units)…just a lot of stuff lately. Which certainly isn’t a bad thing. As a general rule, checking facebook while at work/in the office is a poor use of time. My excuse is that I’ll run some scripts that take a few minutes (or overnight in two cases) to process, thus giving me down time. Well, on the stalker-philic facebook news feed, a friend of mine who happens to work for the university mentioned that Skorton just made an announcement that a new humanities building would be constructed. Technically, this isn’t “new” news, it’s been in the early planning stages for four years, enough that I wrote a blog entry about it almost three years ago. At the time, the project was evaluated to be about 60,000 square feet (35,000 new) with a budget of $45.1 million, in three conjoined structures similar in massing to the original building. Well, according to the project’s website, the square footage has stayed about the same (66,500 sq ft), but the design has evolved quite a ways. A large atrium will be the centerpiece of the structure, and it will also contain the largest auditorium on the Arts Quad. The building will have a large cafe, faculty offices and classrooms, and be the hub for several smaller Arts and Sciences departments (which ones are undetermined, the only one confirmed to move in is the Romance Studies Dept.). The project, which will be funded mostly through donations, is budgeted at $61 million, with a tentative construction start date of summer 2013 and a completion date of the end of 2015. The building is designed by Koetter, Kim & Associates, the same firm that was responsible for the Physical Sciences Building. Well, I can’t say I’m particularly impressed. Seems like Cornell is in its next iteration of the “giant atrium for cross-pollination of ideas”, and the overall design, while not offensive by any means, is a rather plain, mostly glass box. Not exactly eliciting much of an impassioned response from this armchair critic. Lots of news tidbits today. So, I can’t believe I missed this piece of news on Friday, but it was my department picnic, so I wasn’t exactly around my computer much. In hotel news, the Cornell Sun and the Ithaca Journal are reporting that the Holiday Inn downtown is seeking a nine-story expansion, with the goal of starting construction in November of 2012. The Sun article notes “The expansion, if approved, will replace some of the hotel’s existing structures“, with a tripling of conference/meeting space and in increase in rooms from 182 to 195. A two-story ballroom and entertainment area would also be a part of the plan, to be built on the north side of the hotel. As an added benefit, the addition would create 20 to 25 new jobs. Looking at the layout, the “Executive Tower” of the hotel is surrounded by two-story wings, which would be demolished as part of the redevelopment. The new nine-story tower will be built on the Clinton Street side of the property (south side). The ten-story tower that presently resides on the property was built in 1984, while the rest of the property, originally built as a Ramada Inn, dates from 1972. The Holiday Inn was last renovated in 2004. The project seems to be within current zoning, which is CBD-100, so the nine story addition will be equal to or less than 100 feet in total height. 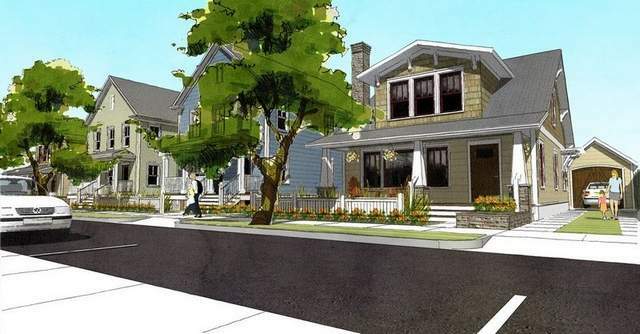 In other news, the houses and townhomes associated with the Vine Street Cottages project are officially a go. The site has been graded, utilities are being installed and they’re paving the private road through the property (which doesn’t quite make sense to me, since they’re going for a traditional-style neighborhood, but I digress). The first model house will be complete by the Spring, and the other units will be built as interest demands. The final build-out plans 19 homes and 10 townhouse units. Prices will be in the mid-300,000s for homes and mid-200,000s for townhomes (for the record, the average house in Ithaca is worth about $191,000). Lastly, the Seneca Way mixed-use project has received preliminary approval after receiving zoning variances. Final approval is expected shortly, and the project is expected to begin construction in late spring 2012, with construction lasting nine months. The original financing for the project has fallen through in the year it took to modify and approve the project, but the developer is looking to secure alternative financing. Whether or not they’ll have the resources to start construction as expected seems to be up in the air. The five-story building seeks to have a parking garage at street level, commercial space on the floor above, and 32 high-end apartments on the upper floors. The building met with angry opposition from neighbors over its height and massing. The take-away here seems to be to tread carefully when proposing new buildings next to historic areas with well-heeled owners. The “deer carcass” structure I criticized seems to be gone, which is an improvement. Those giant pinnacles by the front entrance, however, make me think of “The Aggro Crag” from the Nickelodeon Guts TV show. I’m not sure whether or not to call that an improvement. 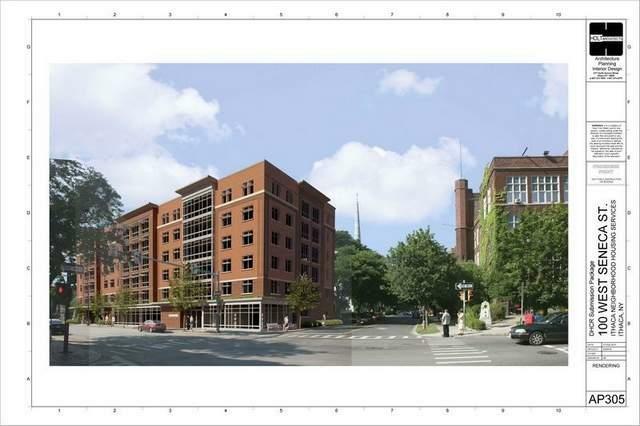 “Ithaca Neighborhood Housing Services and not-for-profit housing developer PathStone Corporation have received enough commitments for funding needed to build the $14.5 million Breckenridge Place in downtown Ithaca. Some readers might recall that this building was placed on hold after the initial round of state grants passed them over for funding last year. Now that the funding gap has been cleared, the project should have a relatively steady path to construction and completion (one can hope). The building is still the design of Ithaca-based HOLT Architects, though from the rendering in the paper, it appears to have undergone a revision. The site of the building is currently occupied by the Women’s community Building (shown below). 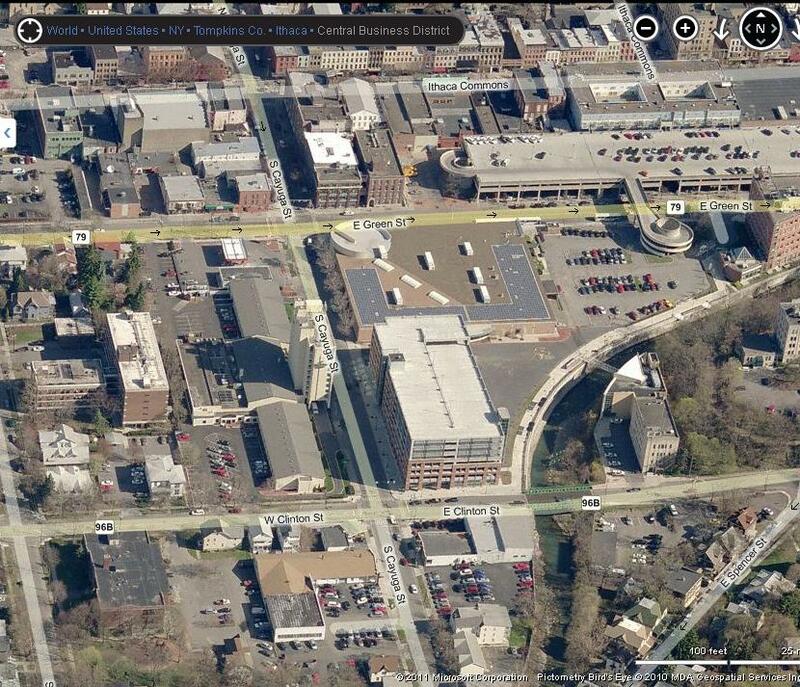 So, it looks like the development of downtown Ithaca is starting off the autumn season on a strong note this year.